The XA30 and XA35 are two of the latest additions to Canon’s compact “XA” line of professional camcorders. These cameras retain all the key features and the same portable body design of their predecessors, the XA20 and XA25, but they provide a few significant updates, such as improved low-light performance; a new 1/2.84-inch HD CMOS Pro image sensor with a +3dB boost in its signal-to-noise ratio for images that are cleaner-looking; an interval recording function; and the Wide DR and Highlight Priority gamma modes. With their imaging capabilities and compact size, these new Canon camcorders can be used in a wide range of applications, from event coverage to independent filmmaking. Both these new camcorders are equipped with an integrated 20x Canon zoom that features a 35mm equivalent focal range of 26.8 to 576 millimeters. Like their previous models, they can record MPEG4 or AVCHD format videos at resolutions of up to 1080p at frame rates of 24, 30 or 60 fps. Also new to the XA line of Canon HD camcorders are fast (maximum of 1200x) and slow (maximum of 0.4x) recording options, including a new interval mode that adds selective speeds, to further enhance the ability of a videographer to shoot creatively or to produce time-lapse video effects. You can access these modes via the convenient user interface that is displayed on a 1.23 million-dot OLED and vivid 3.5-inch touch-panel display, with 10,000:1 contrast ratio electronic viewfinder (EVF) that features controllable iris. Plus, the display features a “view assist” function to provide you the ability to adjust gamma and brightness setting of both the display and the EVF while in highlight priority gamma mode to help display subjects as realistic as possible. These cameras also feature high-definition peaking for better focus ability and clearer and more pristine images; advanced display features that allow for adjustment of zebra, test tone and color bars; and full manual control and assignable buttons for custom shooting. As for the Wide DR function, it is an option integrated in Canon’s professional CINEMA EOS cameras that allows you to compress high-brightness areas to achieve a wider dynamic range of 600%. Not only that this will help suppress overexposure, but will also produce smooth gradations in shadows and highlights, while maintaining a finalized look without the need for post-production processing. As for the highlight priority mode, it provides an HDR-like quality to your videos by reducing the amount of mid-tone compression and highlights on the gamma curve, helping to maintain highlight exposure. Videos are recorded to dual SD card slots that you can set up for either simultaneous recording for instant data backup and redundancy or relay recording for longer record times. 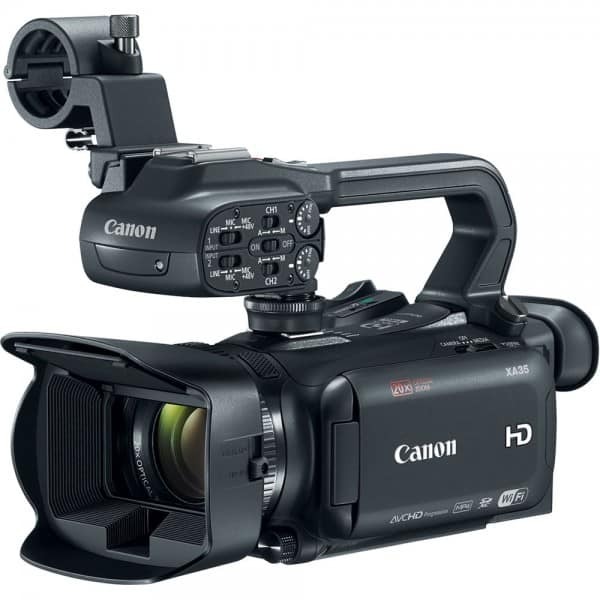 The CANON XA30 and XA35 camcorders also come with a detachable top handle that offers manual audio level controls and dual XLR audio inputs with phantom power. The handle is built with a specialized emitter to support infrared recording, this component offers enhanced sensitivity to allow for great IR recordings that are approximately 1.4 times brighter than with the previous models. Speaking of audio, additional features include connectivity to various inputs and outputs, optional Bluetooth microphone, as well as a 2-way intercom-like capability. 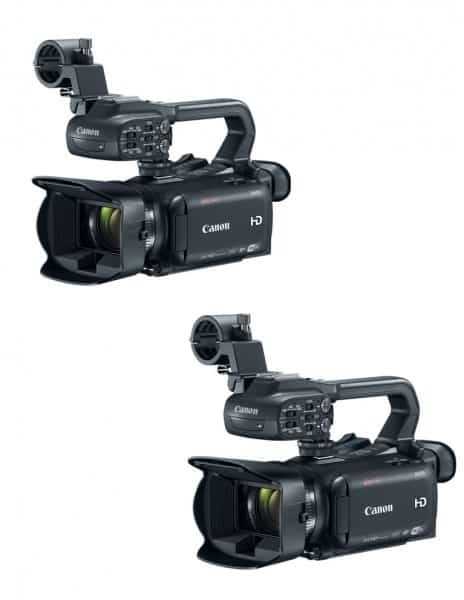 As for connection capabilities, these new Canon camcorders feature wireless connectivity for easy file sharing and upload. They enable FTP file transfer of 3Mbps MP4 format videos to cover breaking news with their dual-band wireless support, which are 5GHz and 2.4GHz respectively. There is also the wireless remote feature that enables you to control the cameras through a web browser on a compatible mobile device or PC. Specifically, you can use this feature on playing back or downloading your camera videos to the PC through the browser or to your mobile device connected to the camera. In the playback mode, you can upload your video files to social media sites via the free Movie Uploader app. Aside from the wireless connectivity features, the XA30 and XA35 also support the use of the optional Canon GP-E2 GPS receiver, which you can connect using a USB cable to get time and location information recorded during shooting. This functionality is very useful in a way that it supports editing workflow and adds valuable data for archiving purposes. The main difference between the XA30 and XA35 is that the latter adds an HD/SD-SDI output for direct connection to a news truck, a serial digital interface (SDI) switcher or other professional video equipment. The XA35 also allows for external recording of uncompressed video signals. The Canon XA30 and XA35 were certainly designed for professional videographers who are looking for that high quality recording whilst constantly on the move. Journalists, documentarians and filmmakers who are always in uncertain environments are assured that the XA30 and XA35 will deliver fast and powerful performance. The XA30 and XA35 are also ideal for non-professionals and enthusiasts alike because they are remarkably easy to use, displaying automatic functions perfect for the education or corporate settings. -Values given are approximate figures. *1 Compatible with AVCHD ver. 2.0 specifications. *2 Linear PCM is available only when the recording mode is 28 Mbps LPCM (50.00P) or 24 Mbps LPCM. *3 This camcorder supports Exif 2.3 (also called “Exif Print”). Exif Print is a standard for enhancing the communication between camcorders and printers. By connecting to an Exif Print-compliant printer, the camcorder’s image data at the time of shooting is used and optimized, yielding extremely high quality prints. 28 Mbps LPCM (50.00P) and 28 Mbps (50.00P): 2 hr. 30 min. 24 Mbps LPCM and 24 Mbps: 2 hr. 55 min. 17 Mbps: 4 hr. 10 min. 5 Mbps: 12 hr. 15 min. 35 Mbps (50.00P): 2 hr. 24 Mbps: 2 hr. 55 min. 17 Mbps: 4 hr. 10 min. 4 Mbps: 17 hr. 20 min. 3 Mbps: 22 hr. 55 min. 28 Mbps LPCM (50.00P) and 28 Mbps (50.00P): 35 min. 24 Mbps LPCM and 24 Mbps: 40 min. 17 Mbps: 1 hr. 35 Mbps (50.00P): 30 min. 24 Mbps: 40 min. 17 Mbps: 1 hr. 4 Mbps: 4 hr. 20 min. 3 Mbps: 5 hr. 40 min.